The players earn points at the end of each of the three years for every castle where they are represented by a knight. The score is the product of the surface area of the castle and the level where the knight stands. The player who collects the most points over the three years is the winner. Place the board in the middle of the table. Each player selects a color and takes 1 scoring marker and the 6 knights of the same color. Place the scoring markers at the start of the scoring track. Each player takes a codex card. There are different phases cards according to the number of players. Place the appropriate card (for 2, 3 or 4 players) face up on the table and return the other two cards to the box. Each player takes the 10 action cards in his color, shuffles them and places them face down on the table. Place the king next to the board. Place the tower blocks next to the board. This is the common supply. 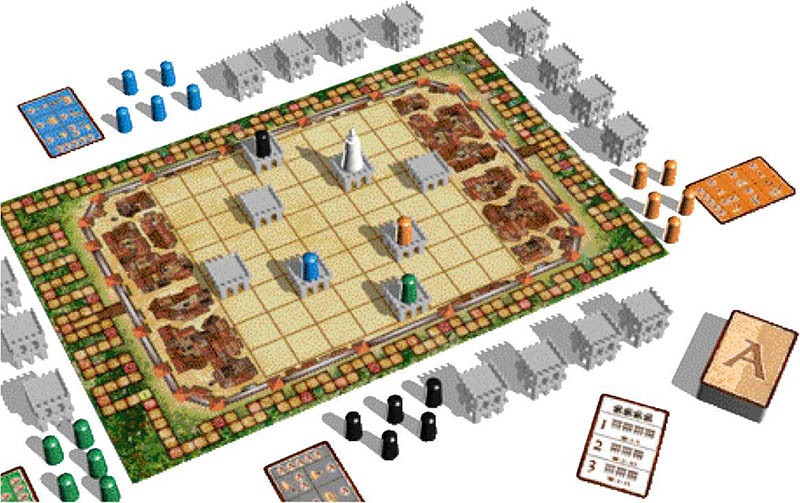 Place 8 of them on the 8 spaces on the board marked with towers. These are the foundations of the 8 castles and may be removed during the game. 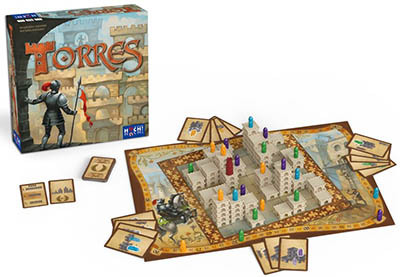 Beginning with the youngest player and moving clockwise, each player places one of their knights on an empty castle. Thus, each player starts one knight on a different castle. The last player places the king on any empty castle, making this castle the king's castle for the first year. It is important that all players understand how the levels are counted: A knight's level is the height above the board where it is standing. For example, if a knight is standing on the board, it is at level 0. A knight standing on a tower with a single tower block is at level 1. A knight standing on a tower made of two tower blocks is at level 2 and so on. A knight may or may not be on the highest level of a tower, however, when scoring, only the knight's level is counted. Torres is played over three years or phases. At the end of each phase the players' positions are scored. The first phase lasts for four rounds. Each of the second and third phases lasts for three rounds (except in a two player game when all three phases are four rounds). Each player takes one turn in clockwise order during each round. Before each phase, the players take tower blocks from the common supply. The number to be taken is printed on the PHASES card. The players stack the tower blocks as shown on the phases card. These blocks are the player's personal supply for this phase. The youngest player starts and play follows clockwise around the table. On a player's turn, he has 5 action points (AP) to spend in any order on the following actions, which are also summarized on the codex cards. Adjacency, for the purpose of adding knights, is orthogonal, but not diagonal. 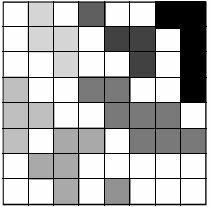 Thus, at most, there are only four possible spaces adjacent to an existing knight. The space where the knight is added must be at the same level or a lower level than the existing knight. The new knight may be placed anynumber of levels lower, but may not be placed on a higher level than the existing knight. A knight may move up only one level per move (ex. A), but may move down any number of levels (ex. B). A knight may only be moved to spaces not occupied by the king or another knight, whether the knight is of the same or a different color (ex. C). Note: the tower blocks have doors on all four sides. The knights may use these doors to travel through the castles! This means that a knight can enter a castle through any door and exit from any other door of this castle. This costs only 1 AP. When moving through a castle, a knight cannot go up levels, but may descend as far as he chooses (unless, of course, an action card allows different movement). In this way a knight may pass through as many castles in a turn as the player spends APs. The stacks of tower blocks before a player indicate how many turns he has left in this year/phase. In a player's turn, he may only place the tower blocks from one of the stacks before him. He may, however, choose any of the stacks. A player may choose to build fewer blocks in a turn than are in the stack. In this case, he may distribute the unused blocks on any other stacks in his supply with only the restriction that no stack may ever be taller than three blocks. A player may never add more than three tower blocks in a turn. If the player has more unused blocks than will fit on his remaining stacks, the extra blocks are returned to the common supply. The extra blocks may not be used to create new stacks. If a player has blocks remaining at the end of the phase, they are returned to the common supply. 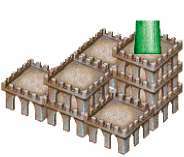 A player must always add to an existing castle, either by placing the block on the board next to the castle (level 0), making the surface area larger, or by placing the block on an empty block, making that part of the castle taller. 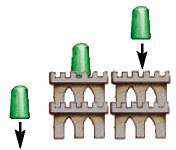 There is one restriction when making the castle taller: a castle may never be taller than its surface area. So if the surface area consists of 3 blocks, the castle is limited to 3 levels. When the surface area of a castle is increased, it may not be done such that it connects with another castle. Thus, castles may only touch diagonally. 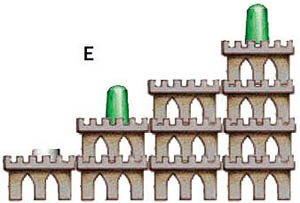 In the example to the left, the black castle has a surface area of 5 spaces, but cannot grow larger in surface area and is limited to 5 levels. When a player spends 1 AP to acquire an action card, he draws the top 3 cards from his deck and selects 1 to keep. He returns the other 2 face down on the top or on the bottom of his deck. If he acquires a second card, he repeats this process. A player may acquire up to two action cards per turn. A card may not be used in the same turn it is acquired. The cards may be held until played. A player may play at most one action card each turn. A player may not play an action card on the same turn it is acquired. A player may play an action card at any time during his turn by placing it face up on the table and performing the action described. He then returns the card to the box, removing it from the game. A player may spend 1 AP to move his scoring marker forward on the scoring track one space. APs are usually used for moving along the scoring track when there is nothing else the player wants to do. Only one scoring marker is allowed per space on the scoring track. If a marker would stop on a space that is already occupied, it is placed on the next empty space on the track. Thus, a player might use this action to gain several points if his marker were immediately behind another marker on the scoring track. At the end of each year/phase, the players score their positions. A player receives points for each castle where he has one or more knights, but only scores once for each castle regardless of the number of knights he has there. However, knights of different colors (belonging to different players) on a castle will score. The players receive points for each castle equal to the product of the number of spaces in the surface area of the castle and the level of their highest knight. Example: Anna's highest knight stands on level 3 and the castle has a surface area of 5 spaces. Thus, she earns 3 x 5 = 15 points for this castle and moves her scoring marker forward 15 spaces on the scoring track. She would earn no additional points if she had a knight on level 2. 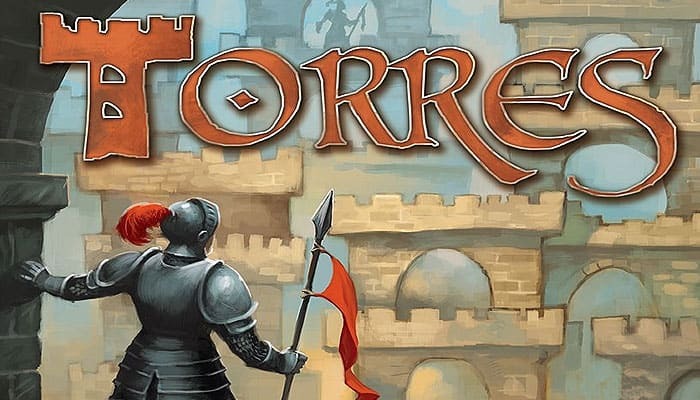 When a castle has knights of different colors, each player scores points for their knight. Other players' knights have no affect on each other. The players are scored in clockwise order starting with the starting player. If a player's marker would be on one that is already occupied after scoring all his castles, he should move his marker to the next empty space on the scoring track. Thus, there will be no ties. After all players have scored their castle positions (including those in the king's castle), the king's bonus is scored. When scoring after the first phase: 5 bonus points if the player has a knight on level 1 of the king's castle. When scoring after the second phase: 10 bonus points if the player has a knight on level 2 of the king's castle. When scoring after the third phase: 15 bonus points if the player has a knight on level 3 of the king's castle. Several players may earn the king's bonus by having their knights in the king's castle on the appropriate level. If a player has a knight in the king's castle on the appropriate level, the player scores both the king's bonus and the castle position score. If a player has a knight in the king's castle that is not on the appropriate level, the player will only receive the castle position score. If a player has two knights in the king's castle on the appropriate level, he does not score the king's bonus twice. A player might have one knight on the appropriate level to receive the king's bonus and another at a higher level for the cast l e position score (ex. F). If neither knight is on the appropriate level, the player only receive s the castle position score (ex. E). Example E: At the end of the first phase, the player has two knights in the king's castle. Unfortunately, neither are on level 1 so the player only scores the castle position of 4 x 4 =16. Had this been the second phase, the player would have also scored the king's bonus of 10 points for a total of 26. Example F: At the end of the first phase, the player has two knights in the king's castle, one on level 1 so it scores the king's bonus of 5. The other is on level two and scores 4 x 2 = 8. Thus, the player receives 13 points for the king's castle after the first phase. The new phase begins after all players have scored their castle positions and received their king's bonus. The players take tower blocks from the common supply as indicated on the phases card. The player, who has the lowest score may now move the king. The player may place the king on any empty space of any castle on any level he chooses. The player need not move the king, If there is no empty space for the king, the player does not move it. Play then continues with the player who was given the opportunity to move the king. The game ends after scoring following the third phase. The player with the most points is the winner.